Two mornings ago I was changing Caleb's diaper first thing in the morning and I had the thought come to me to send him in to go potty on the toilet. So I did. 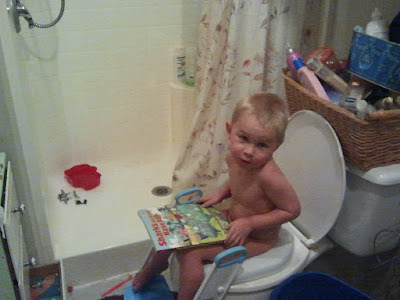 Well, he went right in and used the potty. I decided because of his enthusiasm I would pull out his new Thomas the Tank Engine undies. He was thrilled to put them on and he's used the potty ever since. AMAZING!!!! He even took his diaper off this morning all by himself and pooped in his potty seat we have in his bedroom for that exact purpose. WOW!! I feel so blessed not to have this big step as a battle! Truly Blessed! We purchased a potty seat that has steps and handles that sits over the big toilet seat. The potty seat has a big enough hole so he doesn't feel like he's going to go on the seat. I really like that! Great help! We purchased a cool potty chair to go in his bedroom so he could use it and not have to run to the bathroom a million times during nap and bedtime. VERY Helpful!! I gave Caleb a cup of juice to keep in the bathroom and he took a drink of juice every time he went to sit on the potty the first day of training. This helped him need to go several times that day so he could get the logic down. I also slipped in a couple of chewy fiber bites as a potty treat once to help that process along too. I gave him a Jelly Belly for a Pee Pee treat, Raisins for a Great Try treat, and a square of Chocolate for a Poo Poo treat. Good motivators for the first day. Caleb is Three years and nine months. I don't recommend fighting kids about potty training. Especially boys. Thanks so much for visiting my blog today, Lena! I've missed you. 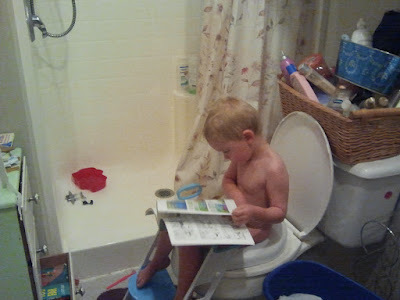 I couldn't agree more with the fighting with kids to potty train idea. I love that they "get it" so much quicker when they're a bit more mature. Thanks for the tips too. We're heading that direction. My #7's been sitting on the potty daily but so far nothing. I know I just need to be patient. She's only 2, but it's exciting to know what lies ahead--a little more freedom and a few more dollars in the budget for something else other than diapers. Congratulations again, and HAPPY BIRTHDAY!!! Thanks Julie! So good to hear from you! Way to go Caleb!!! Love Jeana! Yay! Way to go!! That is SO great that it went so well. Congrats!